Discussion in 'Audio Hardware' started by DaveyF, Apr 5, 2019. I noticed recently that my tube Jadis amps exhibit a buzzing sound through my speakers. Since I utilize a dedicated 20 amp line for these mono blocks, I was surprised tha this could be an issue. To check the problem, tonight I plugged both amps into the line utilizing a cheater plug for both power cables. To my surprise that fixed the problem. Question is what could be causing this grounding issue...the power cable, or the actual in wall receptacle? The receptacle is supposed to float ground...but is that the issue, or is it something else? Thoughts? Good chance you have a difference of potential, voltage, between the safety equipment grounding conductor of the dedicated branch circuit and the safety equipment grounding conductor of the convenience outlet branch circuit. If a difference of potential exists current will flow through the signal grounds of the interconnects through the mono amps causing a 60Hz ground loop hum. For a test connect all the audio equipment to the dedicated circuit. Remove the ground cheater and check for hum. OR, do you have CATV cable box audio out cables connected to your audio system? If yes, if the shield on the CATV providers coax cable is not properly grounded to the system ground of the electrical service the same thing happens as above creating a ground loop hum. A poor and or corroded ground connection on the CATV system can the problem. Agitater, hvbias and F1nut like this. You have equipment at two potentially different grounding levels. When ground current finds it easier to go through your coax shield than it does to go all the way back to the circuit breaker box and through another circuit to your amps, you get noise. Plug everything in to the same outlets. Doctor Fine, Frost, ghost rider and 1 other person like this. @jea48, I was not getting hum through the system, I was hearing a buzzing sound from the speakers, which has now gone away with the cheater plugs used only for the amps...which are plugged into their own dedicated line. As this is a dedicated audio room, I have no TV or other cable connection in the room. The amps are mono blocks, so they each have their own power cord, which is plugged into the dedicated line. All of the other gear is run on a separate line. This diagram is not 100% correct though. Equipment is connected together by signal cables that have both a center (+) wire and a ground. The chassis ground can pick up all sorts of interference, which should be directed out of the equipment through the grounding lug. However, when the equipment has grounding between equipment at a high resistance and there is also resistance in the coaxial signal cable shield, that develops a voltage potential that the audio inputs can pick up. It is a wormhole of unexpected results the more you read about it and try different solutions, because grounding is there for your safety, not your signals. @harby, are you saying that the fact that the buzzing has gone away has to do with the fact that the amps are no longer grounded is now disrupting the ground imbalance between the two sets of outlets. If that is the case, what is the fix? Wouldn’t a better ground connection at the outlet for the dedicated line be in order? 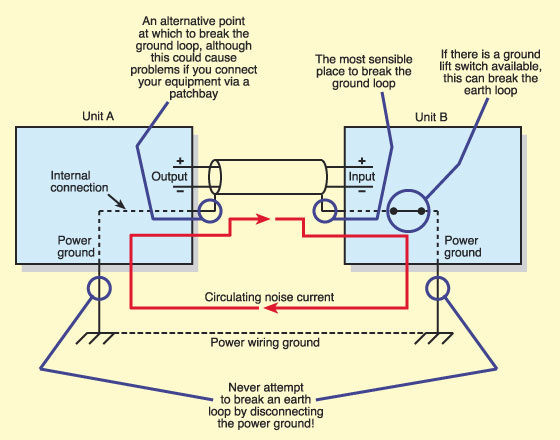 If you look at the "never attempt to break an earth" lines that lead back to power wiring ground in the diagram above, you will see that by using two different circuits for your equipment, you've made the power wiring ground path between equipment very long. You will likely find an immediate cure by plugging all of your 3 pin grounded equipment into the same wall outlet or power strip on the same circuit. Additionally (but not in substitute), you can strap the equipment chassis' together with a supplementary ground wire, like we do between our turntable and phono input. A further improvement may come from replacing RCA interconnects with ones with much better shielding, such as custom-made RG6 cable, giving a lower resistance that reduces the voltage potential formed over the signal wires. Interesting. Doesn’t this also mean that having a dedicated line for the amps would never be a good thing. Since the likelihood that the other gear will illicit the same voltage inequities. Perhaps I am missing something here, but I think you are suggesting that all gear has to be on the same circuit, is that correct? The dedicated line is better than using a circuit shared by your refrigerator and microwave. The amplifiers use a lot of power, the other components do not, so they are not increasing the current draw on the dedicated circuit much when you combine them. One could imagine your preamplifier and other audio equipment might work better without the voltage blips on the same circuit caused by your amp's power draw when the bass hits, but they have power supplies with reservoirs that will isolate them from much of that. We have a bigger ground loop problem that first needs rectification (along with the shock hazard your ungrounded malfunctioning amp could create). I suggest replacing the new outlet with the floating ground. I am under the impression that the dedicated line outlet is of the floating ground type already....could that be what is causing the problem? Thanks again. I still fail to understand why two different circuits can have this issue...as there are a number of folks who have their systems set up this way...and don’t seem to have the problem. Is there a way to adjust the two circuits so that the voltage potential, or whatever it is, is not allowing for the ground loop? Plugging everything into the same outlet seems to be a kludge to me....but then what do I know? Sorry if I wasn't clear. Yes, replace the floating ground outlet. Got it....another receptacle with a fixed ground it is. What do you think of harby’s thoughts above? Because it would seem that replacing the receptacle will not solve the problem, based on what he states. You don't have a ground loop issue. That would result in a hum, not a buzz. I should add that a buzz could be a tube going out and may not have anything to do with the new line. Grab a standard outlet from the hardware store and swap it out. Take you maybe 5 minutes. Don't forget to turn the breaker off. Dave and DaveyF like this. Do you have some documentation of what this means? An electrician would not have put in an ungrounded outlet that looks like a grounded outlet. "Floating Ground" basically means "no ground", not something exactly legal. There is floating neutral, where the AC circuit is powered by a transformer, so neutral isn't connected to the breaker box bus bar, unlikely you have that either. One electrical term for low noise circuits codified in the NEC is "Isolated Ground", when the outlet prong is grounded, but perhaps has its own wire and grounding rod stake, separate from the grounded metal conduit in commercial installation. An isolated ground receptacle needs the ground wire connected, it is insulated from touching the box and conduit for ground. The fact that the 3-to-2 pin dongles made a difference means that the ground isn't floating -- you disconnected ground by using those. Frost, hvbias, F1nut and 1 other person like this. I stand corrected...the outlet is an isolated ground type. I don’t think there is a separate grounding rod stake...pretty sure about that. So why would disconnecting ground cause the elimination of the buzzing sound from the amps?...not hum, as they never did this.. Excellent point of the isolated ground verses a floating one. Nevermind about a bad tube. I missed that everything was ok plugged into a different outlet. Thanks. I initially thought it might be tubes as well, so they were all changed before I tried the Cheater plug...no effect with that. The buzzing went away with the insertion of the cheater plug. I’m definitely trying the new outlet next...like you say, could be an easy fix. Funny you say turn off the breaker, that is what I have always done,..to the jocularity of my electrician friends...mind you, I have never been blown off a roof into a dumpster...like they have, lol. "Buzzing" is hum, but with harmonic distortion. The sound of somebody getting electrocuted in the movies. The outlet seems not the issue, it is just inappropriate technology that gives no benefit, because in your house, you don't have electrical conduit to "isolate" from. Again, it is 99% the use of two circuits with two different long resistive ground wires going all the way back to your circuit breaker box, which creates voltage potential differences between the chassis of components, and creates AC currents in the shields of signal cables between your devices that you can hear. If you must use the power circuits like you are currently doing, you can get RCA ground loop isolators to put on the inputs of your amps. They are transformers that will block this noisy current flow, but may degrade the sound also. Something else (for which I'm not going to Google references, because you can't really fix it), the center-tap transformers in tube amps often leak AC into the ground and neutral, because of imbalance in the windings. Hum, buzz, does it sound like this? For ground loop current to flow it needs a closed circuit, loop, path back to the source. The ground cheater breaks the closed circuit. Like a light switch. For a test plug all the audio the audio equipment into the dedicated branch circuit outlet. Remove the cheater and check for the buzz/hum. You say everything was fine before. The buzz just recently started. Something has changed. My simple test will narrow down the something. Note: The only difference between an IG (Isolated Ground) type receptacle outlet and a regular grounding type receptacle outlet is an IG receptacle outlet has the equipment ground terminal screw and ground contact isolated, insulated, from the metallic supporting back strap of the receptacle outlet. Here is another video on ground loops.